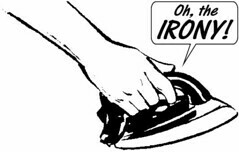 The Open Access Irony Awards: Naming and shaming them | O'Really? How about GigaOm, who shouts stomps and screams against paywalls and yet makes ALL their monet on GigaOmPRO. It’s actually genius, getting others to bankrupt themselves, while you make money. Hi Stephen, I might be missing something, but what does GigaOm have to do with publishing scientific papers? Good to read this, and had been wondering whether there is a place to record irony of this kind. Here is another example: http://www.webcitation.org/65XYPOsnQ (also webcitation is a convenient way to take snapshots). I just wanted to point out that our paper is and was always open access – even before it was published in IJTEL. Here is a link to the postprint: http://know-center.tugraz.at/download_extern/papers/open_science.pdf You can check it yourself: Google indexed it on Nov 13. 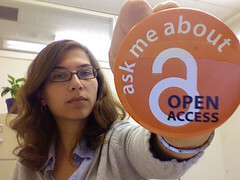 We would not have published with them, if they had not provided the green road to open access. In a way I stand corrected, Peter, and I apologise if this has caused offence. An issue is that from the point of view of an “ordinary seeker after knowledge” the availability of the post-print is not all that obvious, especially as it is typically the closed access published instance of a paper that gets shared around (as in this case – a retweet by Figshare of one of the authors of the paper’s tweet that pointed to the IJTEL instance of the paper not the open instance). Thanks for your answer Seb. No offence taken, just glad that we could clear up the confusion. I see your point about the closed access instance: that can be misleading. Nevertheless, a quick Google search will instantly unearth the freely available post-print, so I do not think that our paper belongs on this list. looking and the properties of the PDF, it says it was last modified, Tuesday, May 14, 2013 3:51:29 PM. So, it took about 2 years for the article to be posted. So, yeah, debateable. posted comment below, didn’t realize I could reply here. Article number 9 is freely available at the very publisher’s site you link to. (As well as freely available via the usual web search channels). that gets added to from time to time. FYI: @oajoe and Duncan Hill, that article was made OA immediately upon acceptance, and we ensured we’d have the right to post it before we submitted. The reason you see a later modified PDF is that I may have fixed a formatting issue or a typo (I don’t recall now).